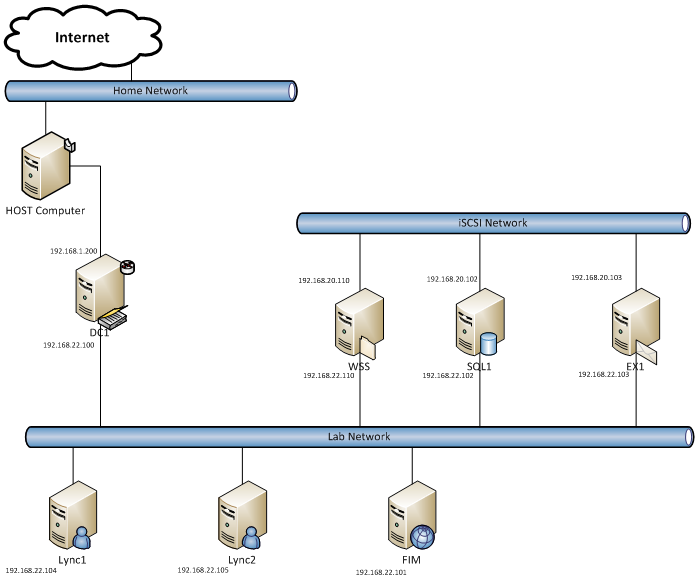 So I decided to build myself a Virtual test network to play with some new technology we are using at work. The next few posts will be about the building of the test network. OK Hardware first. My current home computer was kind of dated so I decided to go ahead and buy a new computer. I could have just as easily upgraded or bought another one for just the lab. I am not listing brands on purpose as I do not think there is really a big difference in who makes the hardware, as long as it works. Next base OS. I will be using this computer for more than just my lab. I was first thinking about using Windows8 as it comes with Hyper-V, but its still too unstable (I did try this first) right now. I could have gone with Windows 2008R2 but that costs more than what I wanted to spend. In the end I went with Windows 7 pro, pro because of the amount of memory I want to use. But, that now leaves me without a built in VM environment. There is a lot of VM environment software to choose from, some free and some you have to pay for. In the end I went with VMWare Workstation. Its not free but it is something I have used before, and that was more important as I was not looking to learn a new VM environment. Last, all the software for the lab. All the things I want to use the lab for are based on Microsoft products. That makes it easy as I can just get a technet subscription and run any Microsoft software for free in the lab. Well not really free as the subscription does have a cost, but it’s a lot less than buying all the software. Just remember technet software is NOT for use in production. Using it in a production environment can cost you a lot in fines.